LED bulb features the latest engineering and design innovations, including proprietary CrimpFin Heatsink design. 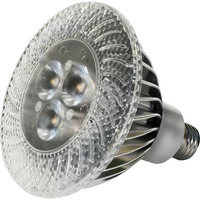 LED advanced light PAR 38 requires just 15 fixed watts to match the lumens of 100 watt PAR incandescents. This dimmable, ultra light bulb is designed to last 50,000 hours. It is ideal for retail, hospitality, furniture, museums and any other commercial application where long bulb life and energy savings are important. The design also includes 1000 lumens, 3000K color, 25 degree beam and no UV or IR radiation.